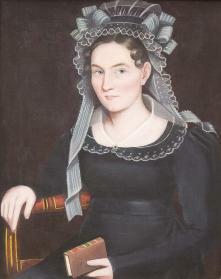 Ammi Phillips was born in Colebrook, Connecticut and began painting portraits of western Massachusetts subjects in about 1811. In 1813 he married Laura Brockway of Schodack, New York, and briefly lived in Troy before settling in Rhinebeck, in Dutchess County. While there, Phillips painted likenesses on both sides of the New York/New England border. These "Border Period'' portraits, executed in pastel shades from 1812 through 1819, feature sitters with gangly arms, glancing sideways. In the 1820s, Phillips experimented with dark and light color contrasts in his portraits of Dutchess, Orange, and Columbia County residents. After his first wife's death, Phillips remarried, lived for a time in Amenia, New York, and then settled in 1836 in Kent and Sharon, Connecticut. His "Kent Period'' portraits feature darker compositions, often with brilliant patches of bright color, and elegant, graceful poses and facial expressions. Phillips returned to Amenia in about 1838, lived in Northeast, New York for a decade, and died in Curtisville, New York in 1865. His more than six hundred extant likenesses span an artistic career of nearly sixty years. Beatrix T. Rumford, ed., American Folk Portraits: Paintings and Drawings from the Abby Aldrich Rockefeller Folk Art Center, Boston, 1981, pp. 149-150.